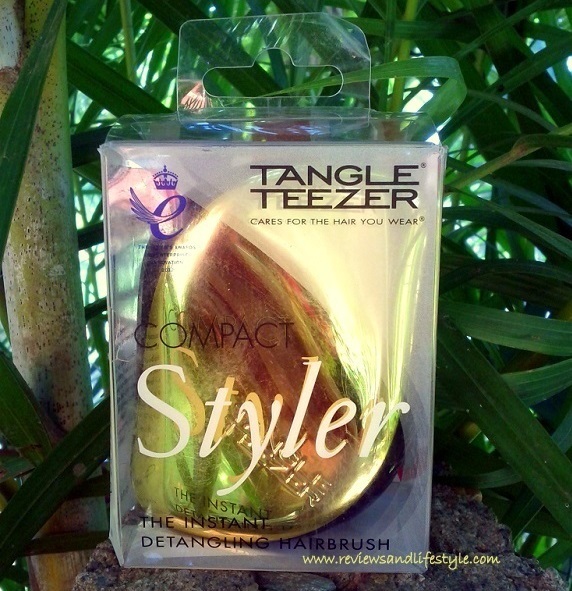 Tangle Teezer Compact Styler instant detangling hairbrush is a cute, little powerful tool that perfectly fits into your palm, can be easily carried around in the purse and gives you detangled, shiny, fabulous hair anytime anywhere. It comes with a click-on click-off lid, that protects its special teeth from fluff, dirt and damage. It is as lightweight as a comb. 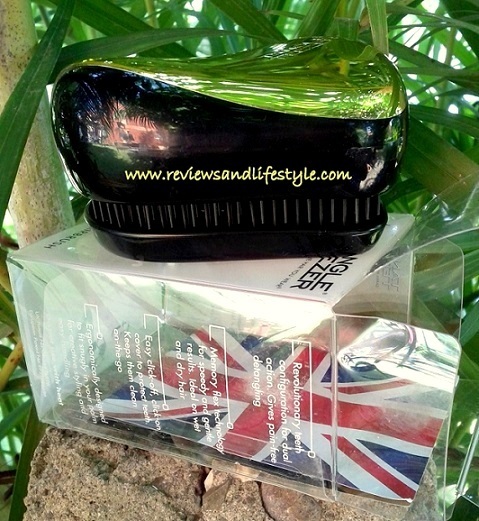 Whether you have just gotten off a bike or a bus, just a few strokes of this Compact Styler and there you are with perfectly groomed hair again. 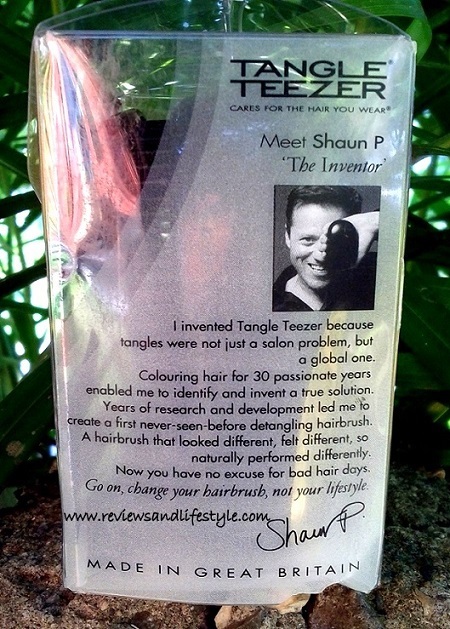 Tangle Teezer was invented and designed by Shaun Pulfrey in late 2007. He was refused funding for his business back then and worked hard to establish his business. By 2013, his company’s turnover was £8.5m, with total sales of six million hairbrushes in more than 60 countries. There are 5 different types of Tangle Teezers, each designed to suit different styling needs and different hair lengths. 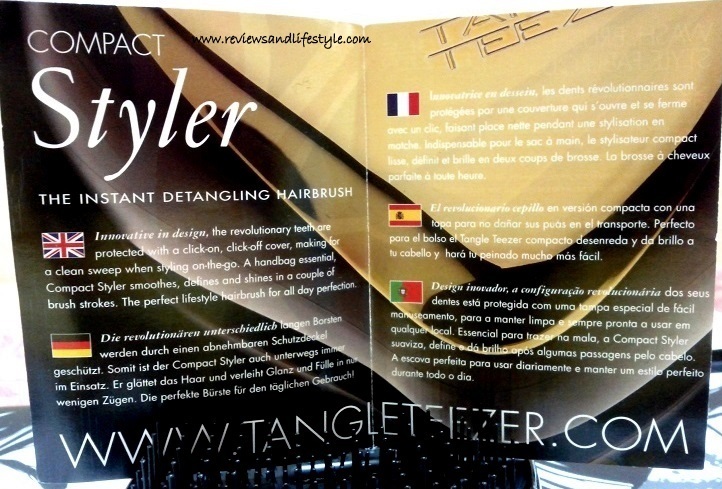 You can read more about each type of Tangle Teezer here. 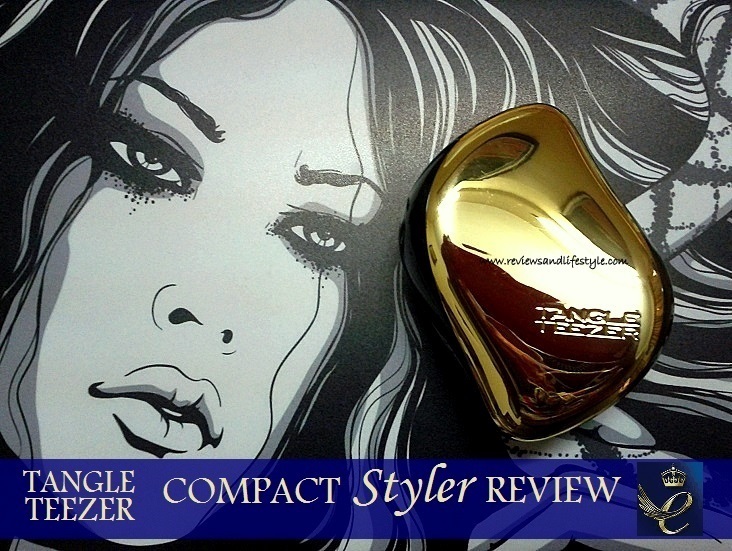 Tangle Teezer Compact Styler is a smaller compact version of The Original Tangle Teezer. It is a multipurpose hairbrush, that not only helps detangle wet/dry hair, but can also be used for back-combing and teasing hair to make a puffed hair style. I have had backcombing done only once in my life while getting ready at a salon, and that turned a nightmare because backcombing tangled my hair extremely bad. 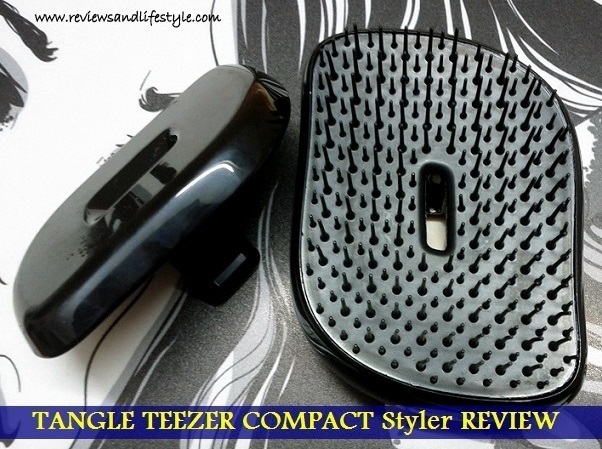 Tried it with this Tangle Teezer and as claimed, it brushed out my back combing very easily. I love the way it cleans out all the lint from my hair and leaves them polished and shiny. Women with long, thick, heavy, wavy or curly hair should try out The Salon Elite or The Original tangle teezers. 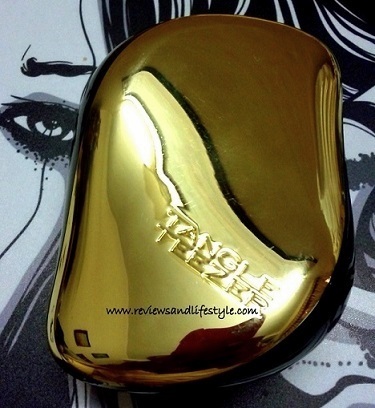 Tangle Teezer Compact Styler is currently priced at Rs 1199. You can get Tangle Teezers at 20% discount at both Amazon.in and Flipkart.com. 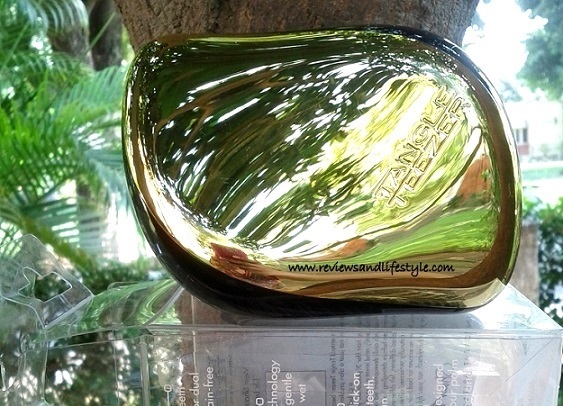 Flipkart has the latest and the most extensive range of Tangle Teezers (check here), while you can see some older stock at lower MRP at Amazon.in. 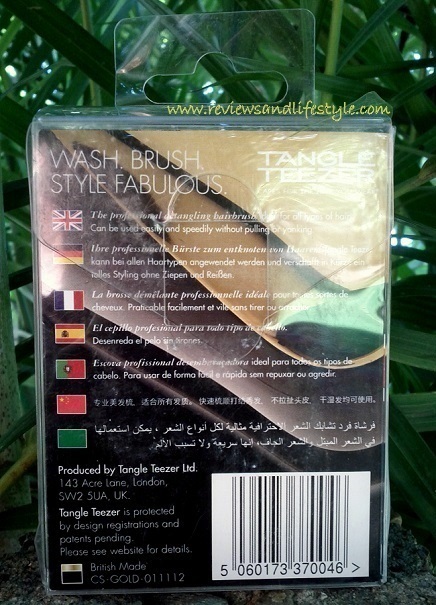 What makes Tangle Teezer Special than Other Hair Brushes? The bristles are flexible and bend easily while brushing. This gives you pain-free detangling. 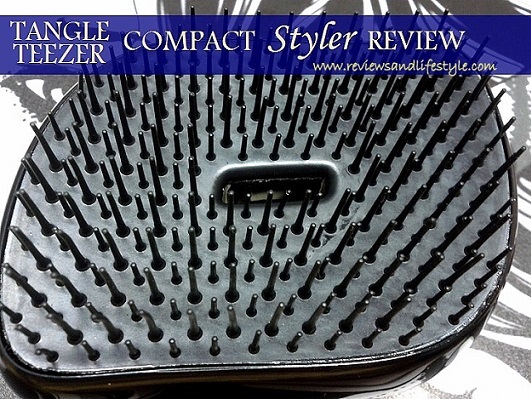 If you look closely, you will notice that this Compact Styler hairbrush has alternate rows of short and long teeth. This special arrangement of different length spikes somehow helps detangle hair much more gently than the hard same-length teeth of other hairbrushes. 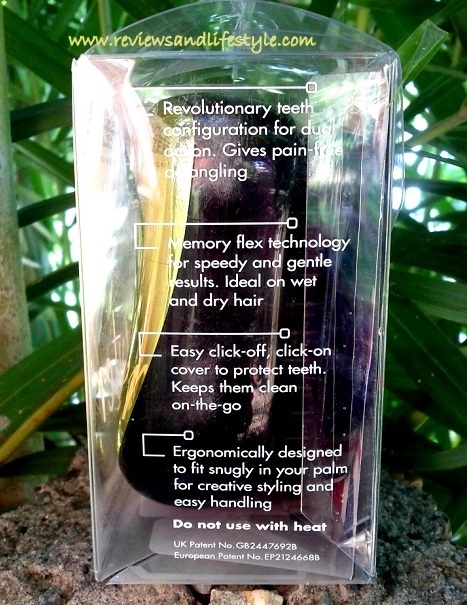 All Tangle Teezer hairbrushes have this kind of teeth and vary only in their size and shape. With the abundance of chemicals we are feeding to our hair these days, tangles are a universal hair problem now. Also, people who are born with naturally thick and heavy hair have to spend a lot of time managing their hair. 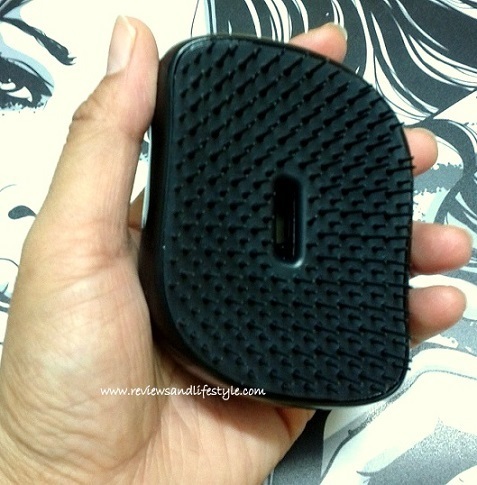 In October, the brand sent me this Tangle Teezer to use and review. I was using KENT PF19 Detanglish Hair brush prior to this. My hair are silky and fine, so my braid loosens up pretty quick. I get tangles mainly in the hair length between my ears and shoulders. In winters, I get tangles due to heavy lint from woolens and quilts. I must confess that it took me time to actually appreciate this hair brush. I used it a few times and felt it was too small for my long hair. So I went back to my KENT hair brush. My 5 years old son has very long hair too and I had to spend at least an hour every weekend detangling his washed hair, strand by strand. The long wait and the tugging and pulling caused by the comb (no matter how gentle I was) had become a torture for him. 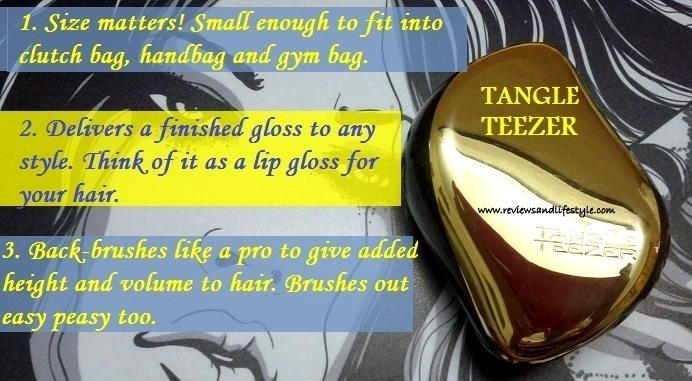 One day he happened to discover this cute little Tangle Teezer in my dressing table, and the golden color instantly made his eyes shine in delight, all the more, when he got to know it's a hairbrush. So I started using it for him and life has definitely been easier for us both since then. Now I am able to detangle his hair within a few minutes while he is watching TV and the smile on his face at the quick pleasant grooming experience says it all. 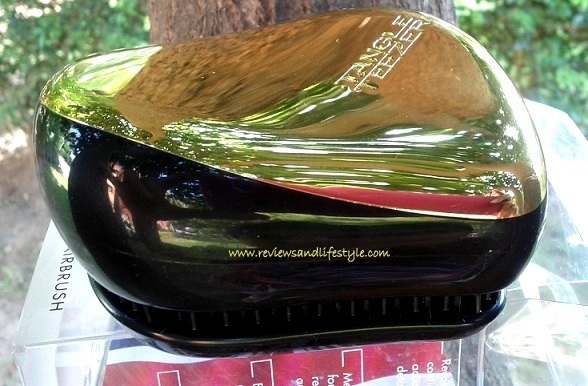 So even though expensive, this tangle teezer is every penny worth it. It does everything it claims. Detangles wet/dry hair in a jiffy. 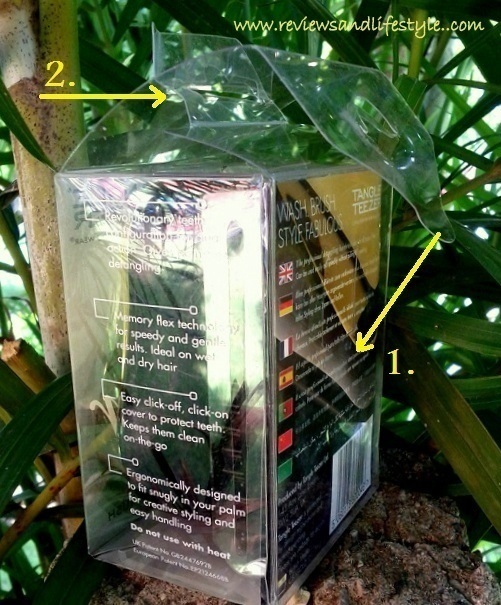 It perfectly cleanses out heavy lint and even fine dirt from my hair leaving scalp itch-free. Hair feel clean, shiny, smooth and polished, better aligned than comb and other hair brushes. 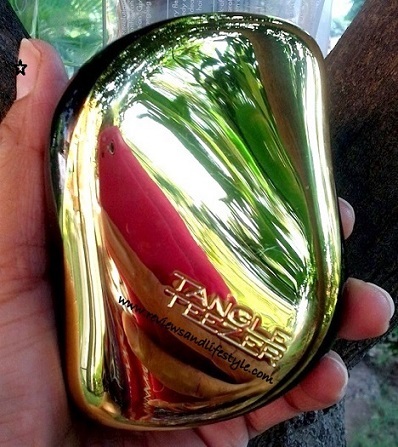 The soft teeth of tangle teezer gently massage the scalp and promote blood circulation to the hair roots. Being lightweight, it is easy to carry and does not ache your arms while grooming long hair. Hygienic with a click-on lid that stays perfectly in place. The size and shape provide a perfect non-slip grip. Cleaning other hairbrushes is a pain, and is time consuming. Whereas you can pull out all hair stuck in a compact styler within a few strokes of hand. It can be simply washed under running water or with a mild soap/shampoo. Some water collects at the base of the brush and easily flows out from a slit like opening on the side. Just shake the brush and leave to air dry in a couple of minutes. 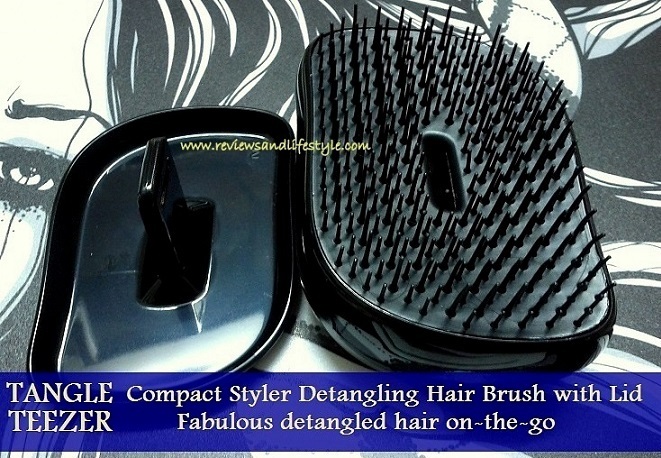 A detangling hair brush that doubles up for a comb and styling brush too. It is THE cutest hair styling tool I have ever seen, with bright to pastel colors and heart melting cute prints like Shaun the Sheep. Indulge! We all experience static in our hair at this time of the year. Being a plastic hair brush, it causes static in the hair like other plastic combs and brushes. Even though it claims to be gentle on even wet hair, I personally think it is not a good idea to brush very wet hair. There's a good amount of friction if you use it on dry tangled hair. It's better to first moist your hair with a serum, oil or any other styling product. Costly, but considering that it's an imported product (Made in the UK), there is customs duty (fee) involved, which adds to the price. Once you use it a few times, the price won't pinch you at all. The Compact Styler isn't really suitable for detangling thick, curly or very long hair, though you can use it for on-the-go styling. For such hair, go for The Original or the Salon Elite Tangle Teezer. Always start detangling from hair ends, gradually moving to upper hair. Never brush your whole hair in long strokes or try to detangle hair forcefully. Tangle teezer's soft and flexible teeth work best if you take one strand of hair at a time, brush it and then move on to another strand. Any hairbrush would tug and pull your hair if you brush dry hair. So for best results, apply a hair serum first and then brush. If you don't have a hair serum, take 3 drops of any hair oil on wet palm. Rub your palms gently and run them through hair with fingers spread like claws, as if you are applying hair gel. And now let the Tangle Teezer do its magic. Comb is now totally out for me and my little one. My son is not willing to leave this tangle teezer for obvious reasons. While I can easily do his hair with it, The Salon Elite or The Original Tangle Teezers are more suitable for my hair length. nicely reviewed dear and thanks to your son that we got to read this today.. it's a savior specially when out in the sun and dust for long before attending a meeting/ function.. will be very handy because of the size too :) btw how is the kent brush? Thanks Supriya. It always leaves me amazed at the amount of lint it pulls out of my hair when I am not even aware there could be any. Same with the Kent paddle brush, when I see so much fine dust and lint in that, I am surprised that my hair had this much stuff on it. But the Kent brush needs a lot of time to clean. It's rubber pad attracts dust and you have to shampoo clean it after every single use. On the other hand, Tangle teezer is sooooo easy to maintain. But yes, you may not like it in the first go, it takes a few uses to get used to it and realize its worth.